You can also download the entire The Two Gentlemen of Verona translation as a PDF! Valentine leaves his friend Proteus to go abroad. Speed returns from a visit with Proteus' beloved, Julia. Lucetta teases her young mistress Julia about a love letter Proteus wrote her. Julia reflects on her love. Proteus' father Antonio decides to send him to serve the emperor, like Valentine. Proteus laments Julia's love. Speed mocks Valentine for loving Silvia. Silvia tricks Valentine into writing his own love letter. Proteus and Julia say goodbye. They exchange rings as a symbolic promise of fidelity. Proteus' servant Lance describes his family members who constantly cry. Panthino calls him aboard the ship. Silvia's suitors--Valentine and Turio--surround her. Proteus arrives and immediately falls in love with Silvia. Speed welcomes Lance, and they talk about their masters' love. Lance keeps confusing Speed. Proteus considers betraying both Julia and Valentine. Julia plans to disguise herself as a boy to go on a journey and see Proteus. Lucetta advises her. The Duke discovers Valentine's plan to run away with Silvia, and banishes him. Lance delays Speed over a piece of paper. Proteus offers to help the Duke with his plan to make Silvia forget Valentine and fall in love with Turio instead. Speed and Valentine run into a group of outlaws in the forest. The outlaws choose Valentine to lead their gang. Proteus woos Silvia, supposedly in Turio's name. Julia (in disguise), overhears their conversation, and is betrayed. Silvia asks her friend Eglamour to accompany her on a journey to find Valentine. He agrees. The disguised Julia enters Proteus' service, and is sent to give Silvia her ring. The two speak about the wronged Julia. Eglamour and Silvia set out on their journey through the forest. Turio asks Proteus about his progress in wooing Silvia. The Duke finds out that Silvia has fled, and goes to find her. The outlaws capture Silvia in the forest. They bring her to their captain, Valentine. Proteus, Silvia, Julia and Valentine meet. Silvia is restored to Valentine. Julia and Proteus reconcile. Romancikova, Nina. "The Two Gentlemen of Verona Translation." LitCharts. LitCharts LLC, 19 May 2017. Web. 22 Apr 2019. 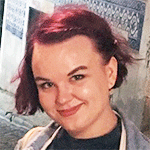 Romancikova, Nina. "The Two Gentlemen of Verona Translation." LitCharts LLC, May 19, 2017. 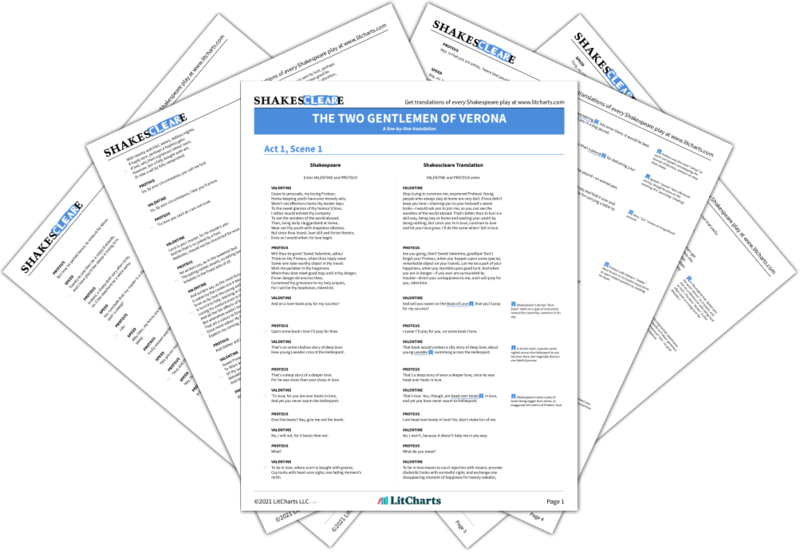 Retrieved April 22, 2019. https://www.litcharts.com/shakescleare/shakespeare-translations/the-two-gentlemen-of-verona.